(TRAVELERS REST, SC) Quality Business Solutions, a woman-owned, cost effective outsource solution for non-core business functions including payroll, insurance, benefit administration and more, has been named as one of the 40 best-performing companies in South Carolina by SC Biz News. 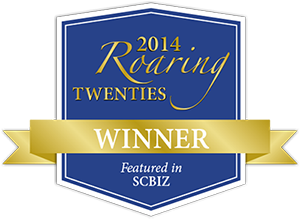 Twenty large companies and 20 small companies have named to the statewide Roaring Twenties list presented annually by SC Biz News. This honor recognizes the state’s best-performing companies based on both dollar and percentage increases in revenue from 2012-2013. Company size was determined by gross revenue: A small company was considered as having $10 million and under in revenue. Large companies were classified as having over $10 million in revenue. Small companies must have had revenues of at least $500,000 each year for the years 2011, 2012 and 2013. Profiles of the winning companies will be published in the winter issue of SCBIZ magazine. The winners will be honored at an event on Oct. 30 at the Marriott Columbia.